I’m back with my third and final DIY for Jo-Ann Fabric & Craft’s Celebrate The Season. This time the theme was “fabulously festive”. 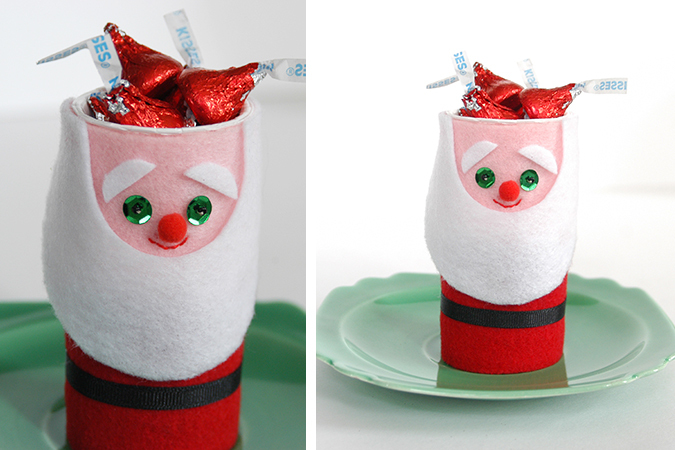 These santa favor cups can not only be used to hold small treats, but you could also add tiny flags with names to use them as place holders. I think they would make any table festive, and they are very easy and quick to make. 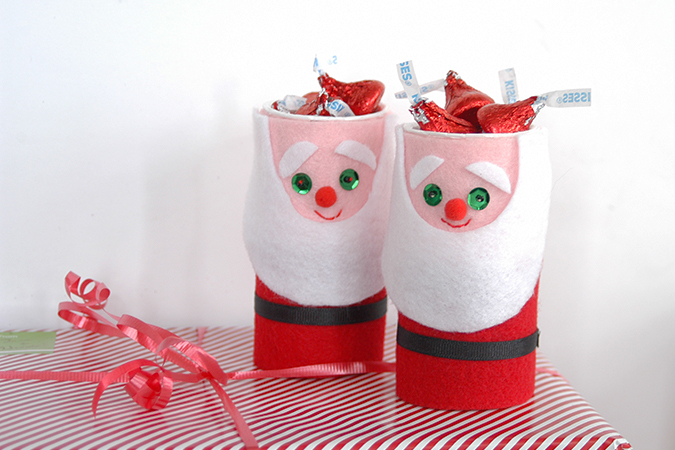 -1 empty toilet paper tube for each Santa, you could cut paper towel roll tubes down to size too. 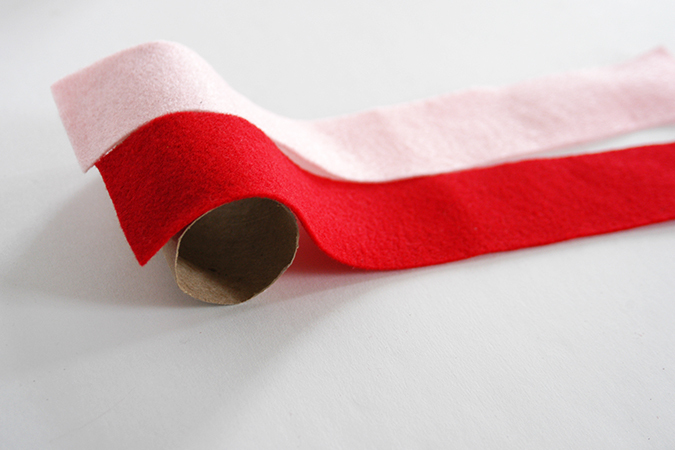 First you will need to cut strips of red and pink felt. Since I used synthetic sheets of felt, I cut my strips long enough to go around the tube twice, so the brown of the tube did not show. 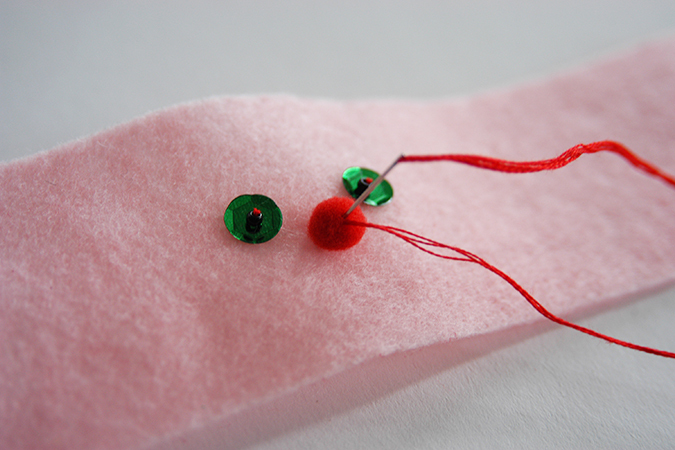 If you use wool blend felts they are thicker and you will only need to cut them long enough to go around once. Next attach your eyes. Thread your needle with 3 strands of embroidery floss, and tie a knot on one end. 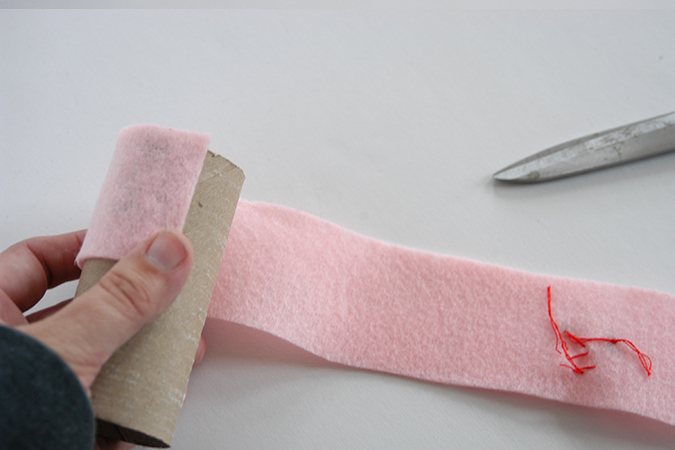 Push you needle through the back of the felt so that the knot is hidden on the wrong side of the felt. 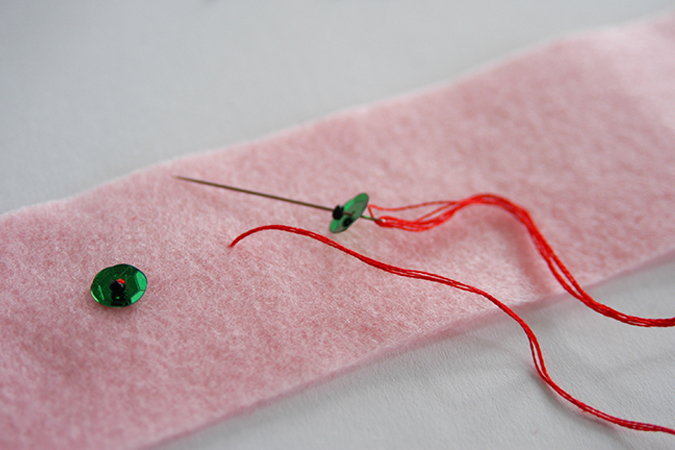 Your needle should then go through a sequin, through a bead, and then back down through the sequin and felt. The seed bead will hold the sequin in place. Sew on both eyes. 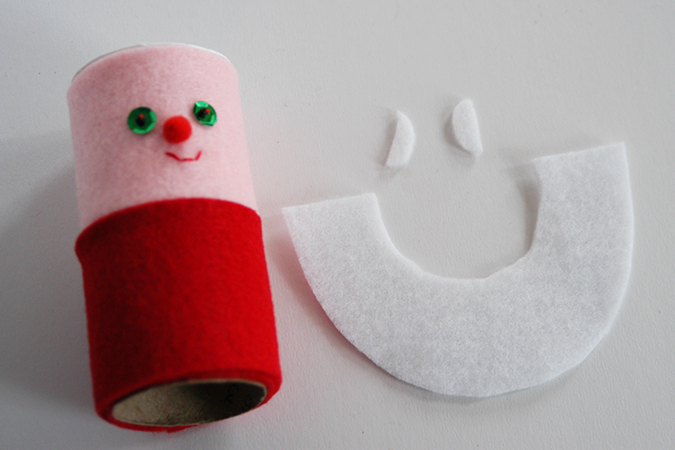 Now stich of glue pom pom nose in place, and with red embroidery floss stitch a little smiling mouth. The next step is to glue your face felt and body felt in place. Since I am wrapping mine around twice I made sure my face is right side up and glued the felt onto the paper tube, securing the end with more hot glue. Then glue the body on so that the felt meets up. 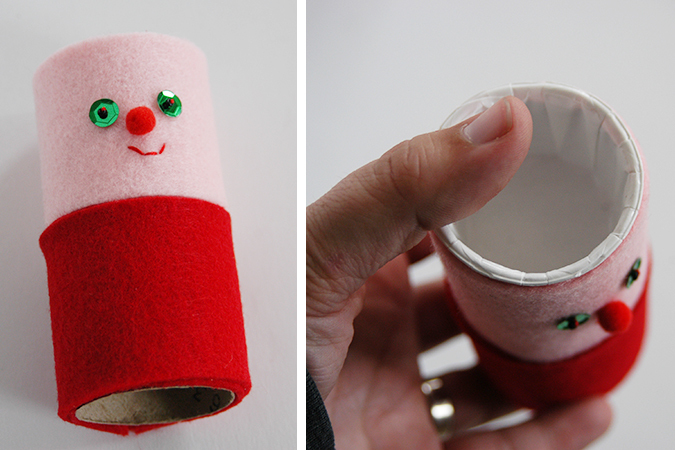 Add a bit of glue to the outside of your paper cup and push it down into the top of the paper tube. Hold in place while glue dries. Now cut a beard and eyebrows from white felt. To make beard cut a half circle from felt, then fold in half and cut another half circle from the center, start small and check against your face, if they cut out area needs to be larger to show more of your face trim a bit. The eyebrows are simply a oval cut in half. Glue the beard on just on sides, and eyebrows in place. 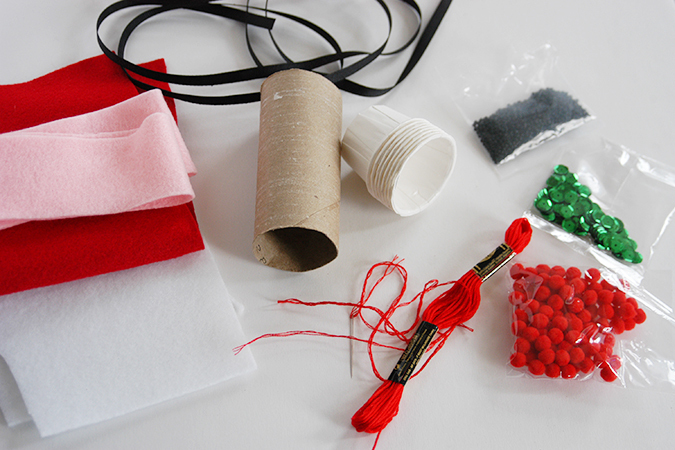 Glue a black ribbon around the center for his belt, and fill the cup with candy or small toys. Here is a coupon from Jo-Ann Fabric & Craft stores to help purchase your supplies. If you end up making some Santa favor cups, I’d love to see them! Tagged christmas, craft, DIY, my work. Bookmark the permalink. The santa’s are so cute Heidi.Thanks for sharing another great idea.I love that they are so easy to make and don’t require a lot of supplies or time. Also your felt elf ornament you made at a crafternoon adorable. Hope you make more pattern kits for ornaments sometime. I enjoyed the owl,mushroom and deer one. I love toilet paper tube crafts! Such a great way to reuse. This is an adorable little Christmas craft. I enjoy reading your blog so much. Thankyou for the inspiration! I love the things you make and your house is so nice too:) thanks! How sweet! Something I could make with my kid even, (well he might appreciate it more if it were a Minecraft character). Thanks for the tutorial!